It's been a little over a month since our family took a little trip with another favorite family to our mutually favorite city (New York, of course). Since I'm feeling the itch to get out of Austin again, I thought, what better time to recap all the fun we had on our last little jaunt? We made it there just in time for some crazy cold winter weather, lots of snow and lots of sludge. With the exception of one extremely lousy day that kept me with Loden in the apartment for 24 hours, we had a pretty swell visit. It was Loden's first plane ride, as well as his first trip outside of Austin. It was also our first trip all together as a family of four, which is quite a lot of firsts, now that I think about it. As daunting as it was to prepare bags for both kids plus myself, I have to say that it was a bit of a relief to feel well-prepared for the unknown. In the end, we didn't check any luggage going there (coming back was a different story), and despite the extreme inconvenience it was to bring our massive stroller, there's truly no way we could have survived the crazy weather situation without it. Well, we could have survived, I suppose, but it would have meant visiting fewer places and doing so much less than we were able to in the end. All that to say, we ended up being as prepared as can be, but what we didn't account for was the location of our rental apartment and the noise pollution that came part-and-parcel with its proximity to some really popular haunts and venues. Were we stoked about how easy it was to access some of our city favorites? Yes! Would we stay there again with a light-sleeping baby and endure sleepless nights filled with wailing police sirens and drunken shouting? No, thanks. I think we'll ditch the East Village next time for UWS or maybe even Chelsea, but I'm pretty glad we were able to make the most of our time in an area in which we love to eat and drink and be merry. We ate maybe a little too much ice cream for how cold it was. Although we did throw in a few hot chocolates for good measure and not a day passed by without a cappuccino or two in hand (certo). It's just so hard to say no to those Cereal Milk affogatos and artisanal ice creams we can only dream about when we're back home. Our most enjoyed confections this time 'round: Milk Bar affogatos (both a blessing and curse to have stayed so close to this place! ), Supermoon Bakehouse cruffins (a new and solid favorite for sure), Van Leeuwen ice cream, Third Rail cappuccini for dayyyys and the famous City Bakery marshmallow + hot cocoa, duh. We didn't leave our little East Village bubble too much during our stay mostly because it was too dang cold and we already had so much planned to do in the area, but we made sure to dedicate a couple of days to get out and explore some important spots. Getting around the city is most definitely a highlight for Avienne, but Loden hasn't quite yet gained that same enthusiasm for trains and travel (note his less-than-impressed face on his first subway ride). He will, though, so I'm looking forward to seeing his wobbly subway train stance on our next visit. High atop the list of spots to visit was Jane's Carousel in DUMBO. Avienne and Alena are pretty enamored with carousels (Austin is definitely lacking in that dept! ), so we bought a pass and stayed a while. 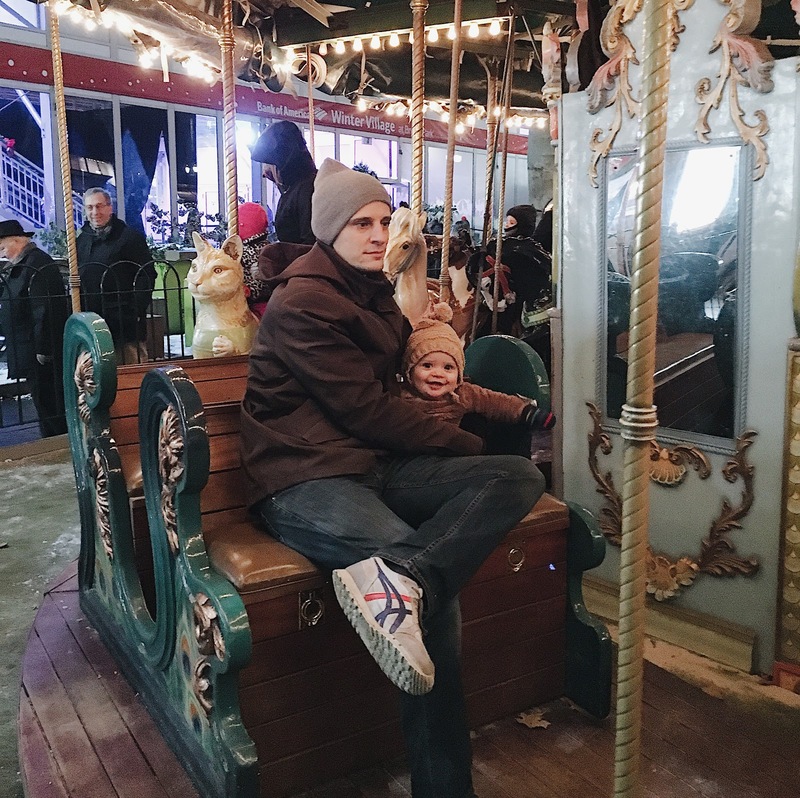 We also made it out to a couple of Christmas markets, and the Bryant Park market surprised us with a bonus carousel that we might have taken one too many trips on before dinner. It was so cold out, but the kiddos did not seem to mind nearly as much as the parents. Seeing playgrounds on corners with a brood of kids in tow means lots of pit-stops were made. It was too cold to spend any great amount of time outdoors, but we made the most of daylight and snuck in a few solid rounds on the swings and even managed some trips down the slide. It still baffles me how kids actually never feel too cold to play outside! All in all, it was a pretty sweet trip and one that I won't soon forget (New York truly never gets old!). We somehow managed to take two kids to our favorite city during the coldest time of the year and enjoy it, so I'll say we're off to a good start as a traveling family of four. It was our one and only trip of 2017, and I feel like we have a lot of catching up to do this year. Here's to planning the next one - may it be sooner than later!